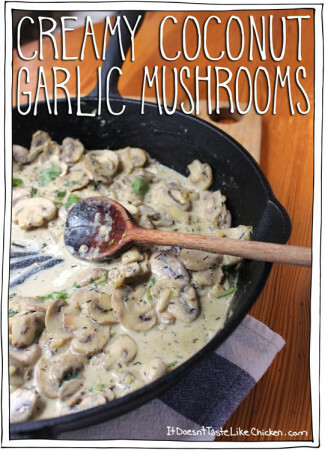 Hello, Creamy Coconut Garlic Mushrooms, you are one incredibly delicious creamy, silky, garlic-y, side dish. Heat the coconut oil in a pan over medium-high heat. When it's hot, add the mushrooms and garlic. Sauté the mushrooms for about 5 minutes until they soften and begin to release their juices. Stir in the coconut milk, thyme, oregano, salt and pepper. Reduce heat to a simmer. Continue to cook for about another 5 minutes. Stir in nutritional yeast if using, and cilantro or parsley. If you feel it needs a bit more sauce, add a dash more coconut milk as desired.